Stress in the seeding year reduces future yields of alfalfa. This occurs because the seeding year determines the stand plant density as well as individual plant size and vigor. The following paragraphs will show that autotoxicity, potato leaf hopper, cover crop, and, possibly, drought stresses in the seeding year will reduce alfalfa yield in future years, even when the stress is gone. We have known for many years that alfalfa is autotoxic; that established plants give off chemicals inhibiting alfalfa seeding germination and growth. Thus we cannot interseed to thicken an alfalfa stand. Further, when plowing down existing stands we must rotate to another crop for a year or more before reseeding alfalfa to allow the autotoxic compounds to be deactivated. 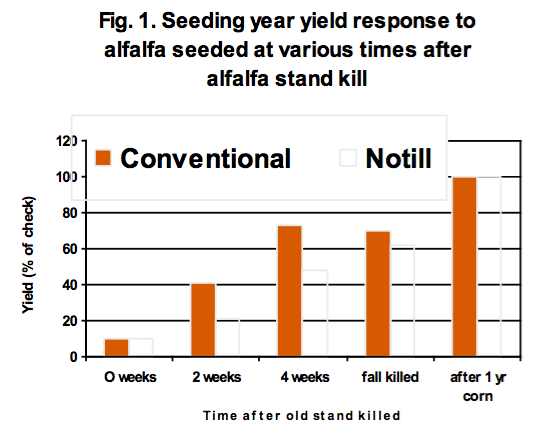 Fig 1 shows the yield effect of alfalfa planted at various 80 times after killing the previous alfalfa stand. While good plant counts were obtained for all seedings after 2 weeks following stand kill, yields were dramatically reduced for both conventional and no-tillage compared to the check (after 1 year of corn). 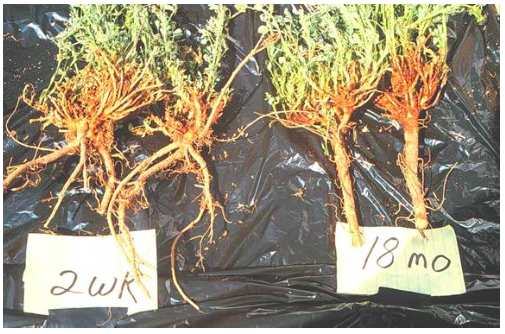 Further, the alfalfa plants affected by autotoxicity grow differently, as shown in the picture, where plants grown in soil with the alfalfa killed two weeks before planting had smaller and more branched roots than alfalfa that had grown in soil with the previous alfalfa stand killed 18 months before alfalfa planting. Thus we can get a good stand seeding as early as 2 to 4 weeks after killing the old stand but the autotoxins will stunt the young, growing alfalfa plants resulting in reduced yield in the seeding year and 20 to 30% yield reductions in years following seeding. Similarly, in studies we conducted several years ago, potato leaf hopper infestations in the seeding year reduced alfalfa plant size for the life of the plant. The smaller plants resulted in less yield in the following years, even when potato leaf hopper was not present or was controlled. 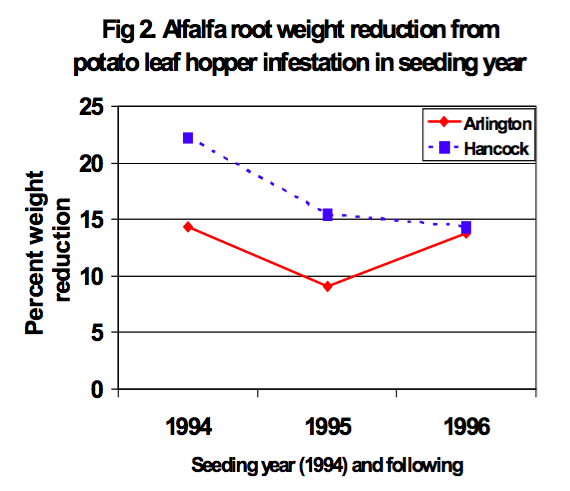 Alfalfa permanently lost yield 0.25 to 0.5 t/a yield potential from the potato leaf hopper stress in the seeding year. The yield loss was greatest when a second stress, i.e. an oat cover crop was present. A third example of seeding year stress causing permanent stand yield loss comes from the cover crop work we have done with Italian ryegrass. 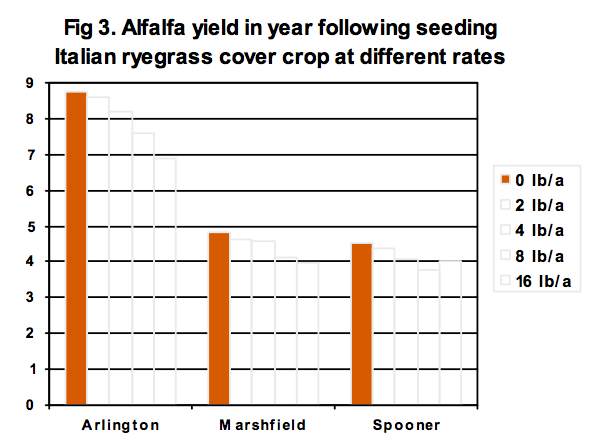 Figure 3 shows the yield of alfalfa the year following seeding when Italian ryegrass was used as a cover crop at various seeding rates. Italian ryegrass is nonwinter-hardy and dies out at the end of the seeding year. However, stress in the seeding year from high ryegrass seeding rates reduced alfalfa yield the next year. Yield reductions the year after seeding due to high cover crop seeding rate were 1.9, 0.9 and 0.5 t/a for the three sites, respectively. We would expect the same response from those using oats as a cover crop and seeding at higher than the 1 bu/a rate. A fourth seeding year stress has been the complaint of a number of farmers that alfalfa seeded in a droughty year did not do as well as the adjacent field seeded either the year before or later. While no data exists to suggest that drought during alfalfa establishment reduces future yield, the reports have been to frequent to ignore. First, that you make every effort to reduce or eliminate seeding year stress to alfalfa. Secondly, established alfalfa fields that are not yielding well should be evaluated first for adequate nutrient levels. If no nutrient deficiencies exist, then consider that the field may have suffered stress in the seeding year and will likely not recover to produce high yields. The field should be considered for replacement with a higher yielding stand.